Part of the fun of the All-New, All-Different Marvel initiative has been watching as creators who were already on a book use the time jump to spin the narrative into somewhere unexpected. While the old adage about the illusion of change does still to some degree play a role, 16 months have advanced in the Marvel universe between both recent time jumps in Time Runs Out and ANAD Marvel, and for Ms. Marvel that offers a very different tone compared to the previous volume, which G. Willow Wilson, Takeshi Miyazawa, and Adrian Alphona capitalize upon. As anyone who’s even remotely kept up with comics in the last few months knows: Ms. Marvel is an Avenger now. From the word go: that’s a big part of Kamala’s life, not just as a superhero, but as someone who’s always idolized them. But anyone who’s been a teenager knows that more responsibilities, means more stress. That being said, while there are new situations for Kamala, Wilson doesn’t forget the ending of last volume, especially with the confessions made in the final issue. One of the best things about Ms. Marvel’s last volume was the supporting cast, and while Wilson does emphasize the importance of the Avengers in Kamala’s life, but also shows how being a teenager, she has a poor ability at balancing out those responsibilities. 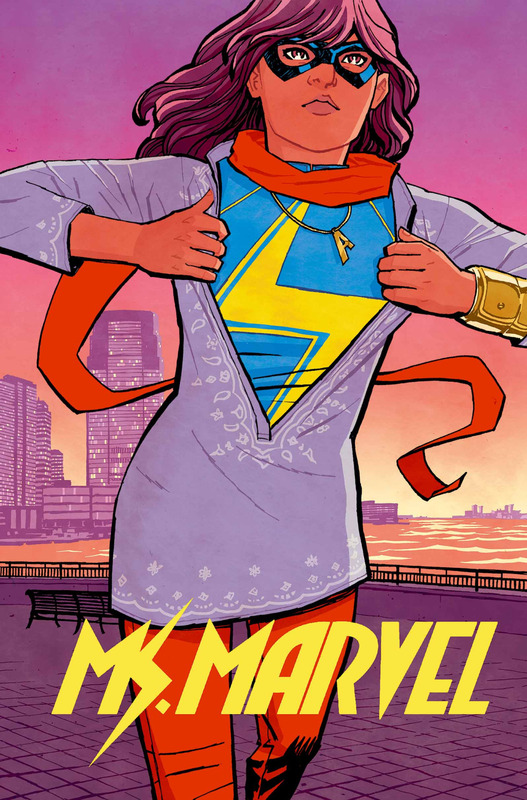 That being said, it also shows some of the changes big and small that have happened in that 8 month time jump from new friends, to teenage jealousy, and even the problems Kamala’s fame as Ms. Marvel brings, there’s a varied new world to explore even in one that’s become familiar to readers. That being said, the art has always been a big part of Ms. Marvel’s appeal, and the relaunch is no different. While Adrian Alphona does draw the final nine pages of the first issue, Takeshi Miyazawa handles the initial twenty one pages. Though Miyazawa continues the style started by Alphona, while not indistinguishable, they mingle together and give a bright, even defined look to Ms. Marvel’s version of New Jersey. One that’s replete with giant frogs, killer drones, and the usual madness of school. While the book is $3.99 now, that price is well worth it for the extra pages and always high quality. If you have to pick one book from the new Marvel, pick this one.